Back in 2008, Dustin and I made a decision to change our eating habits. I know, many of you have heard this story before, but hang with me…there’s a point to this story! Our goal was to eat less processed food and enjoy more “real” food, a word that I learned from reading Michael Pollan’s books. This goal took us down many different roads: veganism, vegetarianism, and finally the discovery of something called pastured bacon (hallelujah!!). To be fully honest, at the time I thought our decision was one that would simply change our meals, nothing more. I never thought for one single second that our decision to eat real food (the stuff that actually comes from the ground or an animal, not altered substances) would change the way we clean, what we use on our skin, and even the way we do laundry. That one decision resulted in a total lifestyle change for our young family. Today, our lifestyle is radically different than it was back in 2008. Our family is larger and noisier (hey kiddos! ), our food is made with real ingredients, and we are more informed about the products we buy or make. In fact, that decision seven years ago has so dramatically changed our lives for the better that I now write this little online space and call you an online friend. Together we share in the joy of making homemade (or better store-bought) products, creating recipes with real ingredients, and talking about simplifying this natural lifestyle. 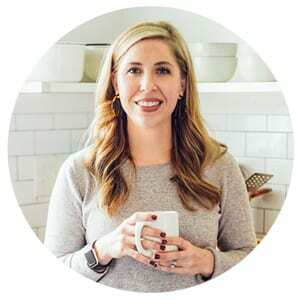 After years and years of learning how to simplify my home with natural cleaning products, I’m so excited to announce that I’ve been working on a new eBook. This book is the first in a DIY series to help you simplify natural living. 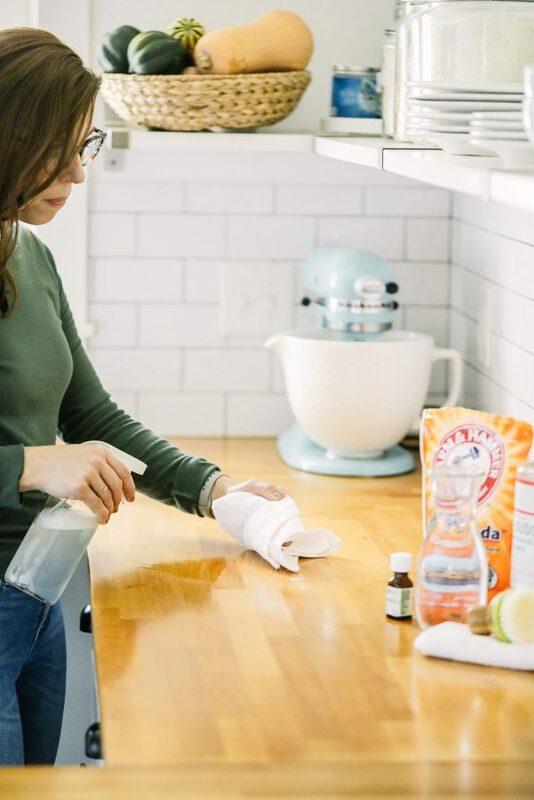 In the book, I’m sharing cleaning recipes, lots of photos (I’m a visual person), tips and tricks for creating a clean and simple home using natural products, and how to determine what to buy versus make. The new book will be out November 27rd. I can’t wait to share this resource with you! And if you’re reading this post after November 23rd, thanks for listening to me…the book is now out. A little Back To The Future for ya ;). Today’s DIY recipe is an example of just one of the cleaning recipes in the new book: a homemade laundry softener. Just like every single recipe in the book, this recipe is easy to make and uses common household ingredients. In fact, the entire recipe calls for just two ingredients: salt and an essential oil. The final result is a natural laundry softener that also works to eliminate odors and freshen clothes. The whole process is a simple, yet effective one. The salt works to soften water and clothing or linens. The essential oil is used to provide extra cleaning power and a very light scent boost to stinky, dirty garments. Two ingredients and two minutes, that’s it! You’ve got this! Today’s DIY recipe is an example of just one of the cleaning recipes in the new book: a homemade laundry softener. Just like every single recipe in the book, this recipe is easy to make and uses common household ingredients. 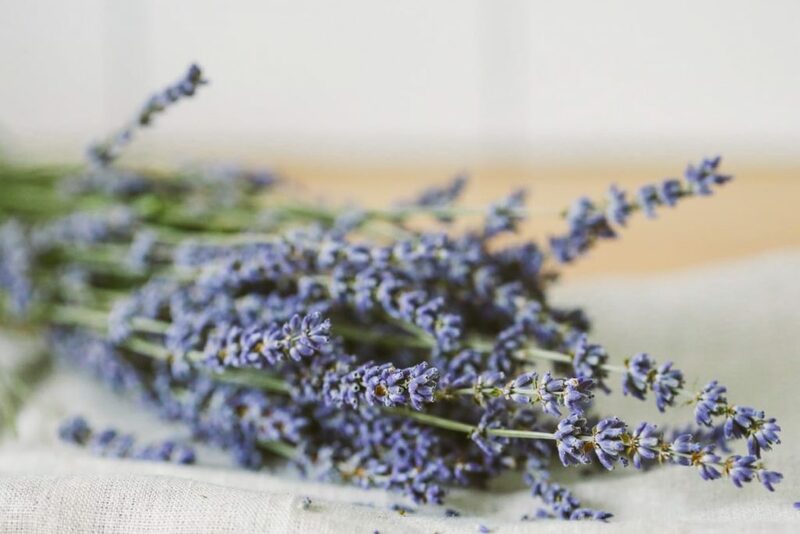 1-2 tsp lavender essential oil peppermint, lemon, or lemongrass. Pour the salt into a large storage container (make sure it's wide enough to mix or shake the salt with the essential oil--I use a bowl, then pour the final mixture into my container). Add the essential oil, then mix the salt and essential oil with a spoon or whisk (or shake the container). Seal the container. I usually let the mixture rest for 24 hours to allow the essential oil to infuse the salt. 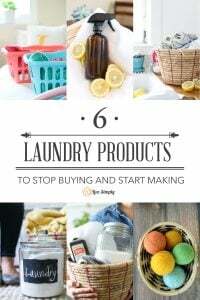 *Essential Oil Note: The essential oil will not add a strong scent to the garments once they’re dry, not like a commercial laundry softener and scent booster (think: Downy). The scent will be subtle and fresh. Due to the cost of essential oils, I use a cheaper yet still reputable brand like NOW for laundry purposes. NOW sells some oils, like lavender, in bulk bottles. The essential oil may also be skipped, if desired. This recipe can easily be doubled or even tripled. You wrote a new eBook and it comes out just a few days (ish) of my birthday?! You shouldn’t have ; ) ! Ohhhh I can’t wait. Awesome, JoAnn! We’ll have to do something extra special!! Happy Birthday :). For those that have a whole house water softener installed (we do)… would that effectively do the same thing as adding this salt laundry softener? Or would that not put enough salt into the wash water to be effective? My guess is it would not? Just curious. Hey Sherry, If you have a water softener and just want to soften specific garments (linens, towels, sheets, etc. ), then I recommend soaking garments in the salt and water for 30 minutes or up to a few hours, then washing the clothes. If you have soft water you may not need a fabric softener. 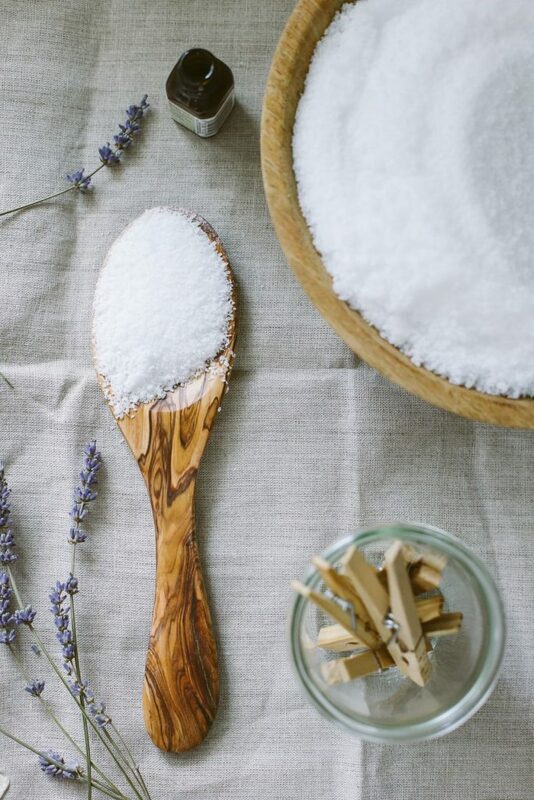 If you’d just like to use the salt as a natural freshener/scent booster, then you may use the salt mixture in the washing machine without soaking. How does this work with front loading machines. Do you put it in the machine? “Q. Can I use Laundry Scent boosters in my HE Laundry Machine? That response sounds like you could do the same with a homemade salt solution–add the salt directly to the machine with the clothes. Your DIY laundry softener is a great idea. I’ll definitely make one just to try it, I would then compare it to my usual softener. Thank you for sharing this. Hi! 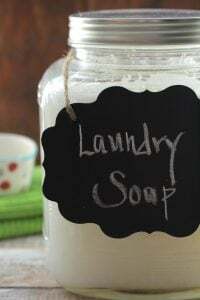 I’ve been loving your homemade laundry soap recipe (although I did thicken it a bit)! Actually thinking it will make great Christmas gifts this year. I wonder what would happen if I just mixed the salt right in with that? Hey Mallary, It’s so great to hear you’re loving the soap recipe. I experimented with adding salt to the laundry soap recipe for the DIY Natural Cleaning eBook releasing on November 23rd. I combined 1-2 cups with my dry laundry soap powder and loved the result, so I bet you could add salt to the liquid version! I would wait until the laundry soap has cooled to add the salt so it doesn’t dissolve in the warm solution. I’ve made my own liquid soap for years, and generally, adding salt to a soap does one of two things, it either causes it to thicken to a paste (normally only if there is an artificial foam booster involved), or it liquifies to a state that can’t be thickened! test with a small quantity of soap and a proportional amount of salt before dumping salt into the whole batch! Hi Mallary, I know you posted this a fee months ago, buy I am wondering how you made the laundry soap recipe thicker. Thanks! Ohhhhhh a new eBook. Can’t wait!!!! Thank you, Krystal! I’m excited to finally release the book. It’s been a long time coming :). Thanks for the info on front loaders-Ive been having a hard time incorporating all your wonderful laundry recipes since I got one-ill check out that website for more tricks. Can’t wait to see the ebook!!! Hey Brandi, That little gem is in the eBook ;). I haven’t been a big laundry soap powder fan for a long time, so I never really focused on creating a homemade version. Then, the eBook came about and I started working on one and love it! The powder is actually what I’m currently using–it’s even easier than a liquid version! I may end up sharing it on the blog, too! *cue screeching like my 6 year old daughter* I can’t wait!!! ? 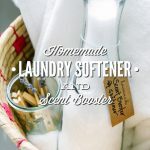 I like using liquid softener, especially since I can just pour it into the dispenser and not have to catch (which I often missed) the rinse cycle. Do you think I could mix this recipe in water and then pour it in the dispenser? Hey Diane, I’m really not sure, but it’s worth a shot! 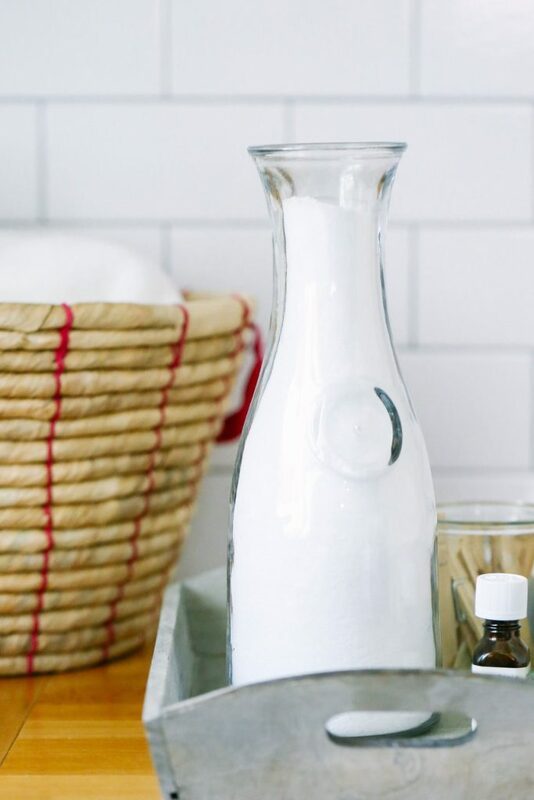 If you’d like a liquid fabric softener another great alternative is white vinegar (you could even add essential oil(s)). Just add 1/2 cup of vinegar to your wash. I wonder how the cost of this stuff compares to Seventh Generation Lavender Fabric Softener. I buy that stuff in bulk. I bet this is cheaper. I bet it would be cheaper! I purchase a giant 3lb box of salt from Costco for $2 (or something like that). I love this idea & am going to try it. I have a question about your liquid laundry detergent… Will it work in an HE machine? Hey Candee, This recipe is based on Mrs. Meyer’s scent booster. Here’s what the site recommends for an HE washer, “Q. Can I use Laundry Scent boosters in my HE Laundry Machine? A. Yes, Mrs. Meyer’s Scent Boosters can be added into your machine right on top of your clothes before starting your wash. Do not put it in any of the dispenser trays.” I would use the salt in the same way. Hey Crystal, I haven’t found that it makes much of a difference. I’ve used both cold and hot water. Personally, I like the way our clothes turn out overall with warm or hot water, but that’s just a preference thing not a product performance thing :). Hey Teresa, It will keep for quite a long time, about 9-12 months. Hello! 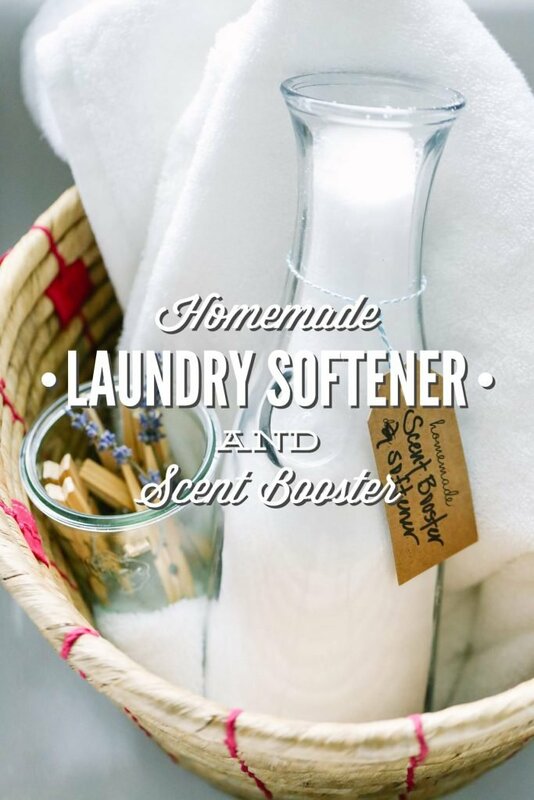 Thank you for sharing your recipe for softener! Do you know how it will work in a HE front loader? Hey Betsy, Yes, you can :). 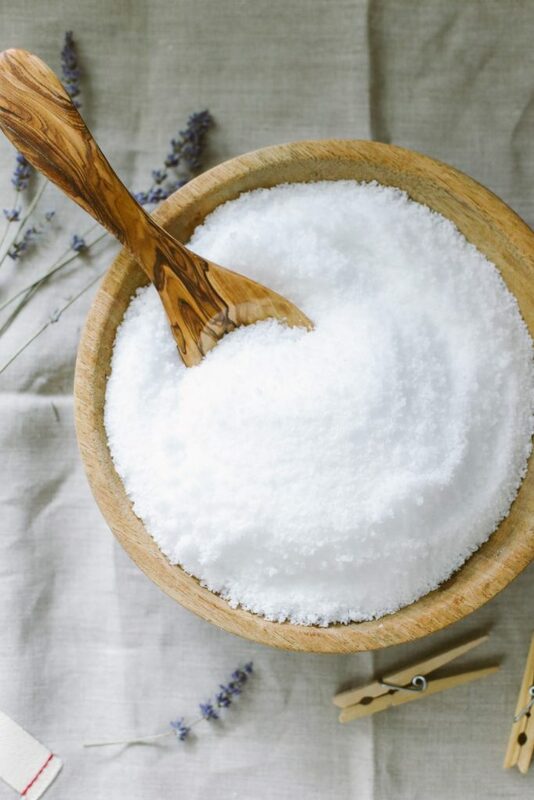 Can Epsom salt be used? I bought a huge bag thingimh it will until I read your recipe. Hey Jennifer, I would definitely try them. They won’t hurt the washing machine, based on my research. So is any kind of salt okay? You singled out sea salt and kosher salt, I’m just confused as to the really differences when you really get down to it. Any wisdom is appreciated! Hey Jocelyn, The salt needs to be in the form of large granules from my experience, which is why I go with sea salt or kosher salt. Hi Kristin. I have just red your blog in water softener/Fragrance I have very hard water and as I live aurally ( In the Kent countryside in the UK) and my house is 175 years old, so we have a septic tank and salt is a no-no for the overflow and soak away Is there any thing else I can use. I put vinegar in the fabric softener dispenser but that is only end of wash. Can you recommend something else. PS I have a front loader machine. Does the scented salt go in the rinse water? It seems like you’re putting it in the wash cycle. Thanks! Hey Laura, I put it in the wash cycle, because I couldn’t ever catch the rinse water in time. I haven’t seen a big difference, when I’ve tried the two different cycles, in the way the towels or clothes feel. You could definitely experiment with both. Does the salt eat away at the washing machine? We just purchased a new machine and my husband would not be happy if my frugal attempts resulted in another new machine. Hey Kris, I haven’t had issues with our washer and the small amount of salt used. I only use fabric softener when I’m washing a load of towels. 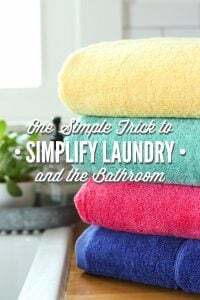 But I might suggest going with a vinegar rinse (the vinegar smell doesn’t stick around) just to be safe with the new washer: https://livesimply.me/2016/01/27/homemade-liquid-fabric-softener/. I am looking for an alternative to shop bought chemical stuff and have read from Miele technician that vinegar corrodes plastic ? Do you use the salt fabric softener with the vinegar or is it one or the other? Hey Jane, It’s one or the other. How much of the softener/scent do I need the add per load? Hi Kristin, For the coarse salt, is it OK to use dishwasher salt?